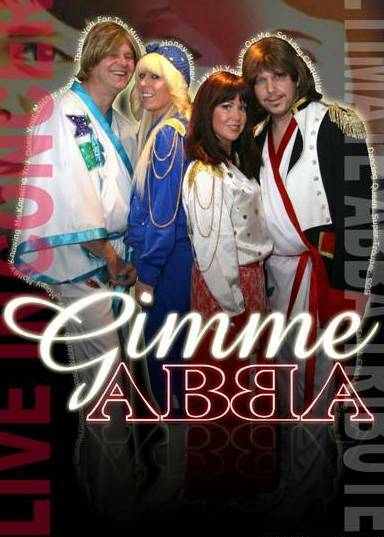 Gimme Abba have been performing this fabulous tribute to ABBA for over 15 years, having enjoyed shows worldwide. Their show comes to you with a repertoire that draws from the greatest hits of Sweden's most famous export. This complete and superb show is packed with all the popular Abba songs known and loves by everyone, the humour, energy and enjoyment generated on stage will delight your audiences and will bring back the memories of that golden ABBA era! This fabulous show comes to your party as a 5 piece band with drummer. The performance is packed with the most popular Abba songs known and loves in addition to some for the ABBA virtuosos, Choreographed dance routines and many costume changes that makes this show unforgettable! Comes with all production elements; their Pro LED Tour stage lighting, Pro P.A sound system along with their Sound Technician to assure you of the best quality sound possible, Superb Show. This fabulous show comes to you as a 4 piece (on half playback) packed with the most popular Abba songs known and loves loved by millions, choreographed dance routines and many costume changes that makes this performance unforgettable! Comes with all production elements; their Pro LED Tour stage lighting, Pro P.A sound system with their Sound Technician to assure you of the best quality sound possible. The UK's best loved Abba show. The fabulous ‘Gimme Abba Girls’ (on playback) will rock your party! The show packed with the most popular Abba songs known and loves loved by millions, choreographed dance routines and many costume changes that makes this performance unforgettable! The show comes with all production elements; their Pro LED Tour stage lighting, Pro P.A sound system with their Sound Technician to assure you of the best quality sound possible - Don't accept anything less! Gimme Abba use a top of the range 4K EV concert P.A system to bring you the very best possible sound and with pro-stage rigging and stunning FX include Intelligent scanners, stage cans, smoke etc... we will make you venue come to life. 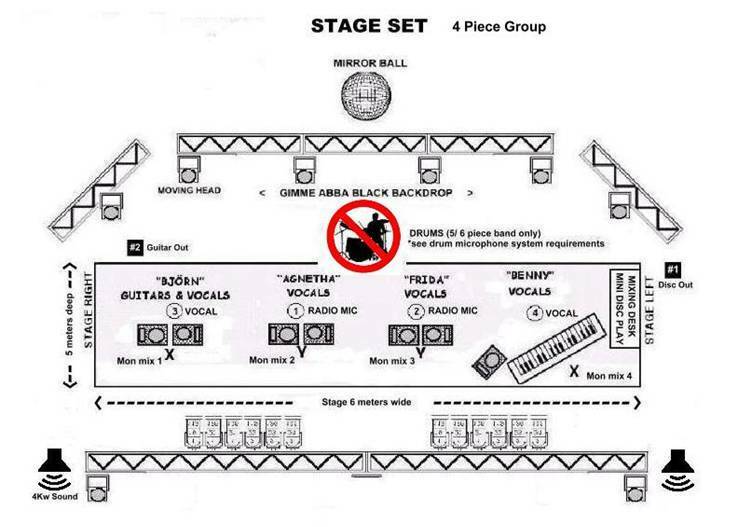 The only requested recommended requirement from the venue is a raised stage approximately minimum 8m x 5m, but we are happy to be advised and work with your suggested stage limitations / room layout. Clients should bear in mind that at the moment we do not provide a rider, we do however require adequate sustenance (food with hot and cold refreshments) to be provided for the band members and the engineers. The fee will be the price for the set and in some case we will require accommodation at the hotel venue or good standard (4*) hotel local to the venue. For private functions a deposit is required. Set up of equipment usually takes around one and a half hours, and equipment is usually taken down after the show, or if a stay is required, sometimes the morning after, this is to ensure a smooth running and professional event. Equipment will generally be set up in the late afternoon, around 6 pm and before 7.30 pm, therefore access to the room will be required from approx. 5.30 pm, their are no set rules and this can be arrange by each individual client. Unfortunately we do not accept bookings at upstairs venues, unless there are adequate and easy-access service lifts, as their are heavy equipment items which cannot be easily lifted. Finally, we will be more than happy to assist in making your event as professional as possible, therefore all aspects relating to the above information can be discussed in more detail by contacting this office.